Construction under natural ground is called ‘Basement’. Now a day due to increasing population there is less availability of land for construction work . The rates of land are very high. To obtain more covered area from same size of land, the construction under natural ground level is being done. Excavation for ‘Basement’ should be avoided in rainy season. While making excavation for basement safety of adjoining buildings and their foundation should be kept in mind. Arrangement for water pump should be made at site for pumping out of rainy water. 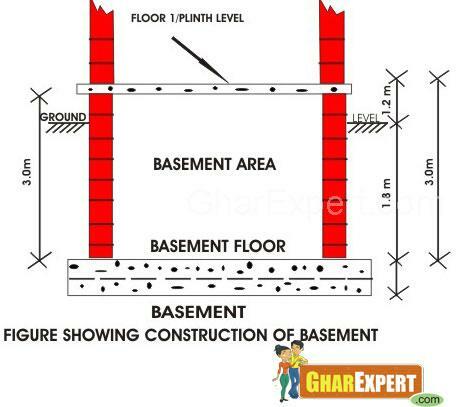 The bearing capacity of soil should be taken 5 feet below the level of basement for designing. Water level of the area should be kept in mind while designing the basement. Damp proofing of side walls should be done properly to avoid damage in building material. Damp proofing in the floor should also be designed to prevent any seepage/dampness under the ground. Water proofing in floor should be designed to prevent the seepage/ dampness during monsoon season because there may be chances of the rise in water level of the ground. Due to the rise in water level, the problem of seepage/dampness in the floors of the basement may occur. While designing side walls and columns, the side thrust of earth around the basement should be taken in account to avoid any damage or cracks in the walls. Arrangements for exhaust fan should be made. Arrangements for ventilation must be kept according to the space available. The electrical wire having good insulation must be used. Try to give minimum joints in electrical wire. The joint surface should properly be insulated as there are many chances of mishap due to dampness. Permanent water pumping arrangements should be fitted in advance. This arrangement can be used to discharge accumulated water due to heavy rain or leakage in the pipe immediately. Sewer line for upper floor should be designed in such a way that can not be harmful to basement in case of blockage or heavy discharge.